A while ago, someone was talking about running MEDCAPs in the villages. 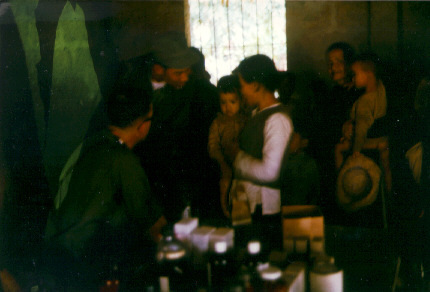 When I was on a sweep with Recon 2/1 during January 1966 in one of the villages northwest of Phu Bai, the MEDCAP team, consisting of Docs and Corpsmen, were flown in to treat the villagers after we cleared the village. Enclosed is a picture I took in a village whose name escapes me, of a MEDCAP team treating the villages. I would like to hear from anyone who was in this area at that time. Merry Christmas to all...this is a lot different than Christmas 1965 spent in the boonies during the monsoons... here is to fallen comrades.